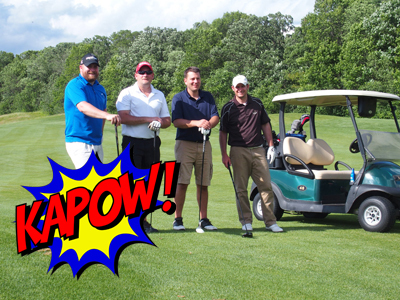 Get ready for the 21st Annual Chamber Golf Tournament that will be held on Monday, June 25, 2018 at White Eagle Golf Club. Plan to participate in this great networking event, which promises to be the premier golf outing of the season. In addition to a round of golf and golf cart, event participants receive give-a-aways, lunch and dinner. If you're unable to golf, join us for just lunch or dinner and the award ceremony. Members may also donate a raffle prize for the event or become an event sponsor. Contact the Chamber Office for more information at (715) 386-8411. A bag drop will be provided as you enter the golf club parking lot. Register and enjoy lunch. Non-golfers are invited to join us for lunch, simply complete registration for "lunch only." Sponsors - lunch for staff on hole must be purchased in advance! Receive your starting hole number at registration. Play will follow a best ball, 18 hole, four person team scramble. (Each player tees off and the best team shot is selected. All players hit their next shot from that position.) Official rules will be provided at the tournament. Join fellow Chamber Members at the club house for beverages and networking! Cash bar available. Register online with the link above or download the registration form.